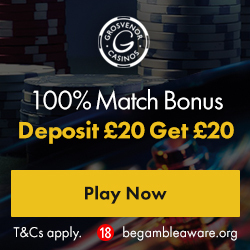 As one of the most popular and respected online casinos (and land-based casinos) in the UK, players know they can trust the types of promos and bonuses carried at Grosvenor Casino. This week, those players are in for a treat, with a week-long series of red-hot deals for all registered players at the online casino site. Make your way to Grosvenor Casino right now, and you can participate in both Game of the Week, and Double Chance Reward promotions at the casino site. This week’s Game of the Week is 300 Shields. When you decide to stake £30 on this game, you’ll pocket £5 free. The promotion runs from Monday April 30 until Sunday May 6, and all you must do is opt-in to the promotion and wager £30 on the 300 Shields slot to claim the offer. The bonus offer comes with 20x wagering requirements. Available at the same time is Grosvenor Casino’s Double Chance Reward promotion. Players at the casino can bag a bonus of £20 which they can use on any game until May 6. If you hit a winning streak, the casino will add 10% on top of your winnings. If you find yourself lacking any luck at all, you could bag an extra 20% bonus back on losses. Again, players simply need to opt-in to the promotion to partake in the offer. They need to deposit and stake £50 on any game and then simply wait to see whether they bag a 10% or 20% bonus on their stakes. What could be simpler? Grosvenor Casino’s twin promos run all week long, so snap up yours before Sunday May 6 at this top casino site today.